Chancel Screen dedicated 1938 St Andrew's Church, Westbury . Who was Nellie Payne? Ever since the death of Miss Ethel Field in 1931, Mrs. Payne had become increasingly aware of how the nine sisters were dwindling in number. One by one they had departed over the years (Louisa, the eldest, in 1921) until now only two of them were left – Mrs. Payne her­self and Sara (Mrs. E. J. C. Whitesides). The question of a suitable memorial was constantly in her mind, and it seemed to her that now was the time to bring her plan to fruition. The important thing was the form which the memorial should take. Natur­ally it would be enshrined in old St. Andrew’s Church, Westbury, for all family memorials so far had found their niche there; but what should it be? Her sisters. Seven sisters. It would have to be something a little out of the ordinary. And in the course of her thinking she recalled York Minster in England, and its famous stained glass window to the memory of five sisters. That was it; but instead of five sisters this memorial should be to seven. And instead of a stained glass window this memorial should take the form of – a screen, a chancel screen. 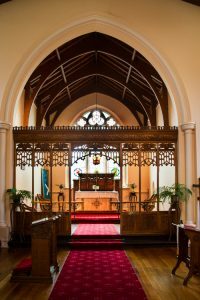 St. Andrew’s was badly in need of one, and it would be a fitting and elegant furnishing for the church in which the seven sisters had all been baptised, most of them had been confirmed, several had been married, and nearly all had wor­shipped. Several of the sisters, moreover, had been the church’s volun­tary organists. Such was the genesis of the beautiful Seven Sisters chancel screen which enriches St. Andrew’s today. This was no ordinary task that the former Nellie Field was undertaking. She had obtained the approval and support of other surviving members of the family, who were sadly aware that their generation of Thomas and Elizabeth Field’s descendants was fast running out of time. Now it required much devoted work to bring the project to completion. The designing alone occupied many weeks, for she had decided on an elaborate and detailed pattern which the family, and also the congrega­tion, would appreciate. Suitable timber was not easily come by, but she obtained what she wanted at last. She was now aged 72, but brain, hand and eye still retained their strength and skill, and she was still capable of standing tirelessly at her bench for long hours on end. Once started, the work proceeded apace. Mrs. Whitesides, at her home in Sandy Bay, kept in constant touch with the progress of the work. She was several years older than her woodcarving sister, and the project had her warm approval. She was the fourth daughter, Sara Jane, who had married Mr. E. J. C. Whitesides, a Hobart banker in 1881. She became the mother of Elvie (afterwards Mrs. Ronald Murdoch), the first Tasmanian to win the women’s golf championship of Australia, and Charles, who rowed in the first Tas­manian Eight to win the King’s Cup in 1906. She was also the mother of Vera Lindsay Whitesides, a skilful artist in pastel portraits, two of which are in the Allport Library and Museum of Fine Arts, Hobart. Who were these seven sisters thus to be commemorated? First, there was Louisa Mary, the second child and eldest daughter, who had never married, but, as ‘dear Louie’, had lived much loved, to a ripe age and had died in 1921. Then there were Elizabeth Sara, the second daughter, who had mar­ried Charles Easton; and Mary Annie, who had married her cousin, Charles Field, of Woodfield. Next, there was Isabella Alice, who had married Frank Wisewould, a solicitor, and had become the mother of the celebrated Dr. Gweneth Wisewould, the much loved resident medical practitioner of Trentham, Victoria. Dr. Wisewould wrote a fascinating autobiography entitled ‘Outpost’, and died, greatly honoured, in January, 1972. The other sisters were: Alice Maud, who had married her cousin Eddington Field; Linda May, who had died in infancy; and Ethelwyn Lindsay, who had died (as mentioned) in 1931. Sunday, January 9th, 1938, was a day long remembered in Westbury. It was the day set aside for the dedication of the chancel screen, which Mrs. Payne, working rapidly as usual, had completed in a remarkably short time. 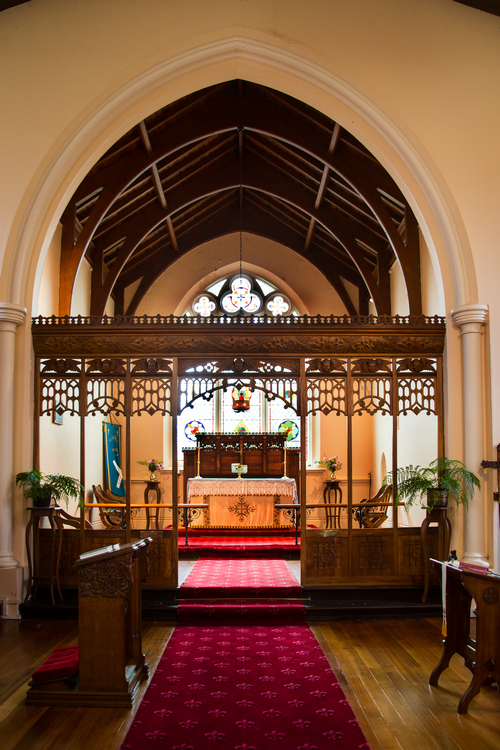 Messrs. Klitzke and Taylor, of Hobart, had put it together and duly fitted it into its place in the church. The beautiful old English church of St. Andrew’s, Westbury, was the scene of a very impressive service yesterday on the occasion of the dedication of the memorial screen made and donated by Mrs. C. A. Payne, of Hobart. A procession of returned soldiers, led by the Westbury Brass Band under the conductorship of Bandmaster B. K. Badcock, and marshalled by Sergeant J. A. Viney, marched to the church, which was so crowded that extra seating had to be provided. 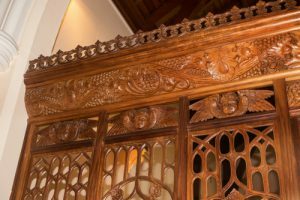 Mrs. Payne has made many gifts to the adornment of St. Andrew’s but perhaps none are more beautiful than the exquisitely carved chancel screen which was dedicated yesterday. For the crowded congregation within the church a special order of service had been arranged; it included Hymn No. 221, which begins, ‘Let saints on earth in concert sing, with those whose work is done’. The Rev. J. W. Bethune, then of Wynyard, took the service, assisted by the Rev. E. W. Julien of Campbell Town, a former Rector of West­bury, and C. J. Randell of Westbury. For his dedicatory address he took as his text verse 41 of Psalm 78, ‘They limited the Holy One of Israel’, the theme being an exhortation to return to the faith of our fathers. He ended with the words: ‘In the faith of Jesus Christ we dedicate this screen to the glory of God and the memory of His servants, the daughters of the late Thomas and Elizabeth Field, of Westfield, of this parish, in the name of the Father, the Son and the Holy Ghost’. The service began at 3 o’clock in the afternoon, and one may be for­given, perhaps, for wondering what might have been the thoughts of those two surviving sisters – Mrs. Payne and Mrs. Whitesides – on such an occasion. After the service more than eighty of those present ‘repaired to Westfield’, where Mrs. Payne received the congratulations of her guests and Mrs. R. C. Field presided over a vast afternoon tea.